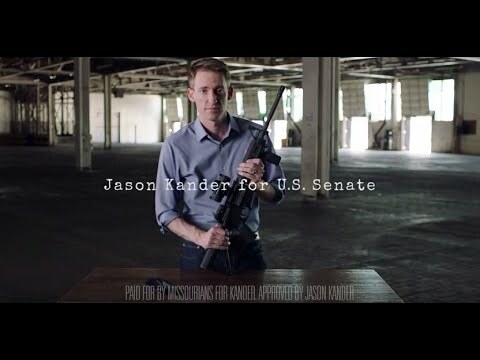 A clip from Jason Kander's fantastic ad. https://www.youtube.com/watch?v=-wqOApBLPio Image via YouTube. I recently outlined two potential paths that could set the stage for a Trump administration, and think that it is worth commenting on the paths that the Democratic National Committee could take. The path that Democrats are likely to take will likely further diminish their party by the time the 2018 midterms are over. The path that many Democrats are loathe to consider might actually allow them to keep their losses in the midterms to a minimum. The election for Chairman is currently scheduled to occur in January, which gives Democrats time to either continue to feud publicly or to start picking up the pieces from the aftermath of the 2016 election. Minnesota Congressman Keith Ellison has received support from Bernie Sanders and Chuck Schumer, which would seem to indicate that he is a shoo-in for DNC Chair. The logic behind an Ellison Chairmanship is that Sanders would have been a more competitive general election candidate and that Democrats should have one of his earliest and most prominent backers to lead them through the wilderness. The problem with this logic is the 2018 Senate map, where Democrats are defending seats in states including North Dakota, Montana, Indiana and West Virginia. These senators have been working on cultivating more moderate images because of the conservative nature of their electorates. Ellison is consistently rated as one of the most liberal and least bipartisan members of Congress. To put this in perspective, The Lugar Center rates members on their bipartisanship, and previous DNC Chair Debbie Wasserman-Schultz ranks as the 50th most bipartisan representative. Ellison, in contrast, clocks in at 403. Do senators like Joe Manchin (4th most bipartisan) and Joe Donnelly (2nd most bipartisan) really want Ellison being the public face of their party? Missouri is far from a liberal state, but Democrat Jason Kander almost knocked off incumbent Senator Roy Blunt on Tuesday. But please know that I’m going to be fine. My wife is gorgeous and brilliant, and my son True is my best little buddy in the world. We are not the people who will be hurt by these election results. So please don’t spend any time being sad for me. If you’re going to be sad for someone, make it the single mom who has cancer and is scared to death about being unable to keep her insurance to continue treatments without Obamacare. Worry about the undocumented student who has only ever known this country and is worried about what happens to her now. Worry about the minimum wage worker trying to stretch $30 into a full grocery trip. Let your heart go out to the college student saddled with enormous debt and unable to get help from a parent whose own graduate degree has forced him into bankruptcy. I met each of those people, in real life, during this campaign. And it fueled me the whole way. But here’s the thing, that fuel is still in my tank. Why? I love this country and I won’t let losing an election force me away from the process. Pick yourself up. Dust yourself off. Yes, Donald Trump is going to be President and the Republicans control the House and the Senate, but I need that to double your resolve, not cause you to give up on our politics. Be proud of the campaign we ran. In a “red” state that Donald Trump won by 19%, we came within 3% of turning the Senate seat blue. And we didn’t do it by hugging the middle and pretending to be moderate Republicans. I wouldn’t change a single day on this campaign. I’m proud that we took on some of the biggest names in Republican politics and darn near shocked the world. We fought for smart environmental policies, for unions, for LGBT equality, for commonsense gun safety, and a host of other important causes. I’m proud that we didn’t back down and that we demonstrated that the most important thing Democrats can do is make their argument. If you were a part of this campaign in even the smallest way, you might feel like stepping away from it all to lick your wounds. Maybe you think you’re done with volunteering or donating or even believing in anything changing. Well, you won’t get a pass from me. Staying engaged has become more important than ever. And this is the time to maintain that engagement. A new generation is stepping forward in America. Don’t let anyone tell you that this generation is selfish. This is a generation that cares more about ideas than ideology and measures patriotism not by a politician’s eagerness to go to war but by their willingness to do what’s right no matter the political cost. And this generation knows better than to let any politician – even a President – tell them that a changing country is a declining country. I don’t know what I’m going to do next or even whether I’ll ever place my name on a ballot again, but I know I’m not leaving this cause behind. To truly care about this country is to demonstrate that you care about her politics the same when you’re winning as when you’re losing. America needs you now more than ever. This generation is patriotic, creative, selfless, and – most importantly – numerous. My campaign might no longer be the vehicle for your activism, but that doesn’t mean you’re excused from standing up and making your voice heard. Ok, was that enough time? We have work to do. You in? Kander ran as a fairly liberal candidate and almost carried Missouri. He of course received national press for running an ad where he assembled a gun blindfolded, while highlighting his military service. Blunt responded to this ad by tying Kander to Hillary Clinton, which was ultimately probably enough to doom him in Missouri. Kander is mentioned here because he there is some speculation that he might be considering a DNC Chair run. He was probably the best candidate of the Senate races this cycle, and it seems to me that Democrats would be foolish to ignore the strengths that he would bring to running the DNC. However, it is all but certain that Ellison will be the next Chair. Howard Dean: Dean has run the DNC in the past, and a lot of state parties love him because he is famous for his 50 state strategy that would empower a lot of states that don’t normally get a lot of attention from the DNC. Martin O’Malley: fresh off receiving a few thousand votes in the 2016 primaries, O’Malley thinks that he has what it takes to lead the Democrats into the future. Tom Perez: Perez was strongly considered as a VP for Clinton, and hails from Maryland like O’Malley does. However, he is as liberal as Ellison in a lot of regards, so he would also probably be a terrible surrogate for the Democrats running in purple and red states. The race for DNC will continue to shape up in the days and weeks to come, but its outcome will say a lot about where Democrats see their future in the months and years to come.